RedCart integration allows you to import your orders directly into Táve where you can attach them to a specific job. Let’s set up the integration now. We’ll start by going to Settings › Data Management › Integration Endpoints and click the button “Integrate with RedCart”. A new endpoint URL will be created on the next screen. You will then log into RedCart Admin with your account username and password. In the left hand menu, select “Configuration” and then “System Integrations“. You will then scroll to the bottom section called “Order Data Integration” and insert the endpoint URL created above into the “Integration URL” field. Your integration is now complete. Any NEW orders that come in through your RedCart account will appear in Settings › Data Management › Imports. You will also have a list of recently imported orders available as well once you’ve started importing a few. 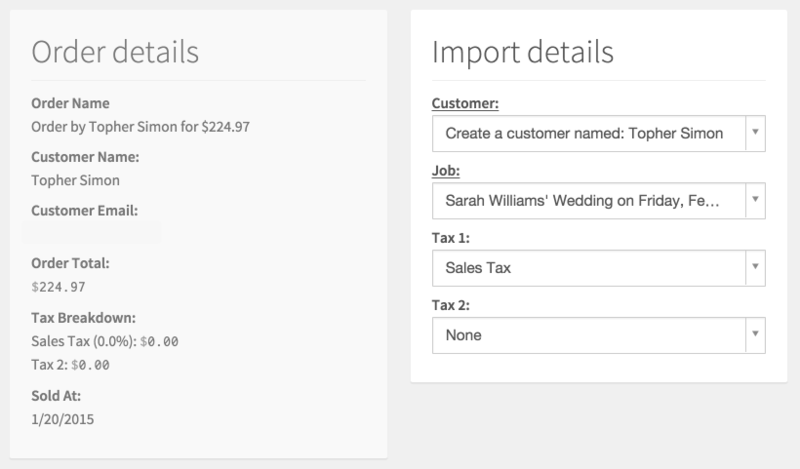 To import the order, simply click the “import” button to the right of the order. You will be presented with Order Details as well as options to attach the order to an existing customer (or create a new one), attach it to a specific job, and assign the sales tax collected through RedCart to one of your tax groups set up in Táve. Click “Save & Continue”. The order has now been successfully imported. If for some reason you need to reimport an old order, you can go to the Orders menu then search for the order you’d like to reimport and select it then click “Resend Order Data for Selected Orders”.